Do you have a favourite Italian restaurant that you like to visit with family or friends? Maybe you like to order some stuffed mushrooms and calamari to start with, followed by a bowl of zuppa toscana soup. The main course arrives, and you’re dining on chicken parmigiana, because no one quite makes it like your local Olive Garden. Perhaps you round the meal off with a warm chocolate baci cake, and a mug of cappuccino. Sound delicious, right? Here are ten facts to check out while you wait until your next Italian delight? When it comes to cuisine, Italians take things quite seriously. The main meal of the day occurs at lunch, also known as il pranzo, or ‘the lunch’. This mean starts with antipasti, commonly referred to as appetizers in America. Antipasti consists of hors d’oeuvres such as olives, cheese, and salami. The first course, il primo, follows with delights such as pasta, or minestrone; a type of soup. Afterwards, il secondo, and the main course, arrives. Meat, fish, and a vegetable-dominated salads are served during this period. To conclude the overall meal, fruit, dessert, and espresso are served. Italians eat many things uncommonly found in American kitchens. These include, but are not limited to: hedgehog, guinea pig, rabbit and hare, sparrows, peacock, donkey, and horse. Breakfast, or la prima colazione, is the only time milky coffee products, such as cappuccino and caffelatte, are consumed. Cakes, and biscuits, are dunked into these beverages, and a form of soup can be made by mashing biscuits into the cup, which is then savoured with a spoon. The pizza, one of the most famous Italian foods, originated during 18th century Naples. Originally a dry, flat bread, pizza was labeled food for poor people. In 1889, the Italian Queen, Margherita, sampled this flat bread. So enthused with it was the Queen, she ordered her chef to prepare various types for her. The most notable of these pizzas was Pizza Margherita, named after the Queen, and consisting of the three colours of the Italian flag made up mozzarella, tomato, and basil. Certain holidays call for certain foods. Such is the case, too, with Italians. At Christmas, il panettone, a type of bread-cake, is consumed. The New Year is celebrated with lentils for good luck. La colomba, another bread-cake but shaped as a dove, is eaten for Easter. The most important food in Italy is pasta. Pasta means ‘paste’, due to being a combination of water, flour, and at times, egg. Pasta can be either ‘dried’, or ‘fresh’, and there are more than a hundred different shapes, and types. Dishes consisting of pasta are regularly eaten as a first course. Some of the pasta shapes and their name meanings are: farfalle (butterflies); penne (pens, or quills); spaghetti (strings), tortellini (little pies); and fettucine (little slices). Spaghetti was originally known as maccheroni. 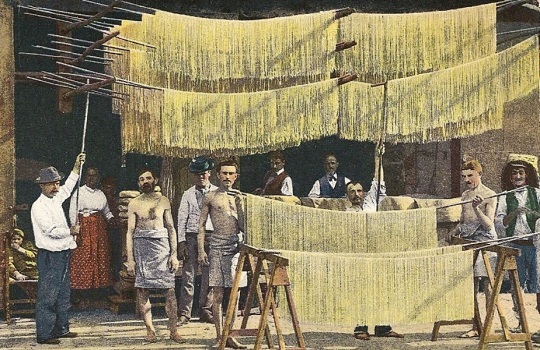 Before the invention of pasta factories, homemade spaghetti would be hung outside to dry. This display oftentimes looked like string, with lead to the pasta being known as spaghetti, or strings. The first pasta factory in Italy belonged to the Agnese family, and opened in 1824, near Genova. Within a few years, the Buitoni family followed suit. The typical Italian dining table is home to water, wine, and bread. 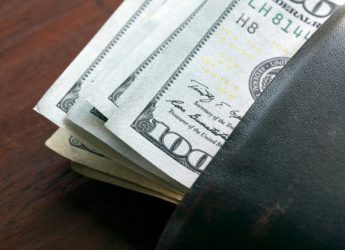 Cultural superstition states that placing bread upside-down on the table leads to bad luck.